Let's talk a little bit about a subject that is near and dear to my heart - FOOD! Everybody needs it. Everybody has their favourite kinds. But not everybody knows how to make it. As a soon-to-be college student living on your own for the first time, the thought of having to actually prepare your own meals can make you a little nervous. You've been used to having most, if not all, of your food prepared by somebody else (ie - MOM). Soon, though, you will have to fend for yourself and actually make meals at your residence. You do not want to be the stereotypical college student living on Instant Noodles 7 days a week. You will need to be able to prepare even some basic meals in order to survive. There are lots of ways to get ready for this momentous shift in your world. Learn how to cook from your Mother between now and this coming September. Copy out her recipes so you have your own to take with you. Search online for easy to follow recipes or subscribe to one of the numerous food websites which will send you an email every day with a new recipe you can try. If having an actual step by step guide is more your style - I've found one on Amazon which just might help. It's called "I Don't Know How To Cook". It includes some very basic instructions on very easy to make meals. Get it for yourself or get it as a gift for the student in your life. There are numerous other 'beginners' recipe books available in various formats - so don't say you couldn't find anything when you are having Kraft Dinner for the fourth time in a week! Bon Appetite! Cheers! Click Below to Check Out The Cookbook! The "I Don't Know How to Cook" Book: 300 Great Recipes You Can't Mess Up! 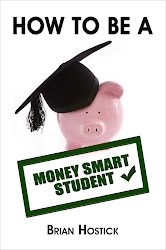 I am thrilled to announce that my first book, 'How To Be A Money Smart Student', has been completed and is published as an e-book on Smashwords.com. I have tried to put together a useful tool for students to help make the transition from their parent's house to living away at college a little less stressful financially. The book is filled with practical money saving tips and resources to help save money while surviving as a full time student. The book is available at the link below for a very reasonable (If I do say so myself) $1.99 - HOWEVER - as my book launch gift for you, my faithful readers, use coupon code MB94J at checkout and the book is yours for just 99 cents! After you pay for the book one time - it is yours to use and download in any of the formats available. You can also preview the first 25% of the book to see what it's all about before you buy the rest. Smashwords also has a way to give the book as a gift. Feel free to give it as a present to any students you know who are getting ready for life on their own. I am honored by the support the Money Smart Student community has given me as I have built this program. Thank you all so very much and I am looking forward to even better things in the months to come. Click below to check out the book. I'm a Guest Post Provider! It's great when I meet people in the business of helping students as I spend time on the internet. One such person is John Carpenter. John has a website http://www.askjohnaboutcollege.com/, devoted to helping students, and their parents, with their questions about the college admissions process - and pretty much any other question they can come up with. That's why I'm honored to have been asked by John to provide this week's guest post for his popular blog. I decided to talk to his readers about something I've talked about a time or two here - student finances. Here's the link to the full entry on John's blog. I hope you'll take a look. Brian's Guest Post on Ask John About College. Money Smart For The SuperBowl! This Sunday marks the end of another great season in the NFL (except for MY team which will remain nameless) with the SuperBowl between the Giants and the Patriots. Millions of football fans will party it up for the big game - including students everywhere. There are a few ways to make sure you don't blow the budget when it comes to enjoying the game this weekend. First, and foremost, don't go to the local sports bar to watch the game. You'll be paying inflated prices for food and 'refreshments'. Never mind the cost of the cab ride home since I KNOW you'd never drink and drive! A better idea would be to arrange a party with friends, either at your place or somewhere which can hold a few more people. Everyone brings their own drink of choice and do a pot luck on snacks so that everyone's contribution is shared by everyone else. Second - unless it's just a friendly wager (dishes for a month, etc) don't place any kind of bets on the game. That money could be put to better use somewhere else. Do you really think you can predict who's going to win the coin toss anyhow? Having a party with friends for the big game will save you money, and it's usually at gatherings like this that somebody does or says something which will become legend in your circle for years to come. Enjoy the game...and if I have to pick one team - go Pats go! February - Time to Focus on Finances! Are you ready? It's February already! That means it's time for high school seniors to really start thinking about what's up with their finances for next year. Time to ask yourself, and your parents, some very important questions. What is it really going to cost me to go away to school next year? Where is the money going to come from for tuition expenses? Have I applied for every scholarship I could possibly qualify for - and if not, what are the deadlines for some more? Where is my book money and living money coming from? Have I got a plan in place to save the money I need from my current job - or the job I plan to get in the summer? How much will I need to save each pay to set up my Emergency Fund for when I'm away? It's all about being connected to your finances and knowing, or finding out, the answers to these questions, and more. It may seem daunting trying to figure out all the possible money situations you might run into. But it would be even more challenging if you went away to college only to find out halfway through the year that you really can't afford to be there - or that you didn't plan properly and there's too much month left at the end of the money. Answer the tough questions now and, I promise you, your first year away at college will be that much more stress-free and enjoyable.